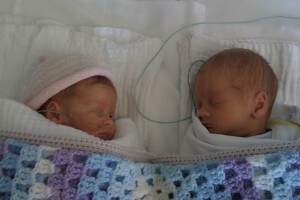 ​Phoebe was born at 32 weeks, the first of twins. After 2 starts at labour, at 25 weeks and then at 28 weeks, 8 long weeks on hospital bed rest, daily scans and countless new room mates, the moment was really here and it happened so quickly. I had just hit the 32 weeks mark at the stroke of midnight – that was the golden goal and the scans indicated that the babies were both over 5 pounds each. It was all looking so safe now, but here I was, in the theatre, looking over at my teeny, tiny baby girl while the large team of nurses and Docters worked on her tiny 1.3kg limp body, and while her brother Louie was being bought into the world, the second team stood ready and waiting for him. Louie’s cries were letting us know he had arrived. They cleaned him up quickly and bought him over to see me. There he was, 1.6kg, Louie! He was making little groans and cries and wanting attention before he was taken away, but I could barely look because still Phoebe wasn’t making any sound. Suddenly they rushed her off, without me even seeing her face and she still hadn’t uttered one little sound. I shooed my husband off to go with them. He was torn between, comforting a confused and sobbing me, and wanting to actually be with the twins, so he kissed me and of he went to protect our special little arrivals. In all that chaos the voices around me were calm and soothing and very much in control. In spite of their reassurances that helpless feeling and enormous anxiety will be something I will never forget. ​It was a tough road for Phoebe but she was a survivor and continued to battle on. Louie was just kept growing and meeting his goals. Everyday held a new challenge, oxygen levels, heart rates, jaundice, temperatures, infections – there were the checks, blood tests and more checks and it just became our normal. They would say to us to never compare the twins as they will develop at differrent rate. So we didn’t, it was just simply Louie grew fast and Phoebe didn’t. We felt safe in our bubble at the Hospital. If anything happened help was on hand. Nearly 6 weeks later and the day came when we finally went home. It was an exciting day, but it was also a daunting and scary feeling to be leaving the protective environment of the Nicu. We arrived home knowing that Phoebe was still vulnerable and she had failed her hearing tests twice. We talked about how that would impact the family if our daughter was deaf. My attitude was that we would just learn sign language and do what ever it took to make sure it was our ‘normal’. She had grown a little, but was still well under the 3 percentile. At about 3 months old the door slammed with the wind and for the first time ever Phoebe’s little body jumped and her eyes just about popped out of her head and she cried. I jumped up to pick her up, while excitedly yelling out to my husband “did you see that she heard it, she heard it”! ​Phoebe still wasn’t thriving. She would attempt to feed, suckling furiously, but she just got exhausted and slept continuously missing feeding times and when I tried to wake her she would initially latch on eagerly, to only fall asleep, exhausted from her efforts. While in the NICU unit the physio extended an invitation to a ‘premmie play group’ that was designed to encourage mothers to come back to the NICU unit with their babies and socialise while the physio played with the babies and monitored their progress. When you have a Premmie baby you don’t feel like you fit in with the usual coffee groups where normal growing babies thrived and comparisons and judgements were made on your parenting methods (because you must be doing something wrong if your baby isn’t doing what theirs is). But, at the Premmie playgroup we all felt we belonged and we knew our babies did too. It was at one of these sessions that the physio took me aside and said that she was concerned that Phoebe wasn’t developing as she should and that she had arranged for the paediatrician to pop in to look at her. ​Suddenly we were flooded with more appointments and given a lot of brochures and ph numbers for me to get advice and assessments done. It was overwhelming. I had to choose one and how could I do that when I knew nothing about what she had or who this ph numbers belonged to? Then one day I got a call from a lady who asked me which service would I like Finding out that one of the centers everyone had told me about was full, I then heard about Conductive Education. I hadn’t heard of them before, but they were the ones that were closest to our home and so I agreed to meet them. I am so happy we had this choice. We walked into the center to be greeted with smiling faces everywhere, The manager the teachers, the conductor, they were all there to welcome us to the center for the first time. The Conductor didn’t rush our baby girl. Phoebe didn’t like to be touched and she was not comfortable with anyone other than her daddy, her siblings and of course me. But over the weeks something miraculous happened. The Conductor had won her over and Phoebe allowed herself to be gently handled. Everytime we went there Phoebe was comfortable and she began to make progress. ​After sometime we were finally give the formal diagnosis. She had a form of Cerebral Palsy called Hemiplegia, it was good to finally have a name to it. Then there came a time when we had to leave the service to live overseas, after the earthquakes in Christchurch. Phoebe was just over 15 months old when we left. We moved to Zimbabwe and services were unavailable for Phoebe. It was a terrifying feeling but throughout our time there Conductive Education kept in contact with us offering support and advice via phone and email. We came back to NZ for a visit and during the few weeks we were there Conductive allowed us to come in and spend time there. We were away for 18 months and during that time Phoebe had slipped backwards and bad habits were starting. ​We returned to New Zealand and enrolled back at Conductive Education just as Phoebe turned 3 years old. Her progress was evident and she was a happy girl being back in her familiar, routine environment. It was also at this time that Phoebe was diagnosed as have Multi Sensory Processing Disorders. We had many difficult times and school holidays were very hard because Phoebe didn’t cope without her Conductive Sessions. The first week back would find me in the office sobbing with the stress due to the holidays and relief to be back and very often venting about the judgements people made about my child and her eratic outbursts,along the way.. There was always a calming, caring shoulder to lean on and encouraging words shared. I always felt truly supported. They understood every moment I experienced and at the time when I was tired and became confused they gave me back my clarity. Phoebe thrived and grew beautifully. What was even more special was that her twin brother also able to attend the center. The twins were very close and did not like being apart and Phoebe relied on Louie for support and Louie wanted to protect her and was always unsettled and tearful without her. Our whole family were always welcomed and even when our eldest child was struggling, she was invited in to have a chat with centre staff and given much support to help her understand why behaviours were happening. The family inclusion and support was outstanding. Phoebe reached many goals during her early years with Conductive and when it came time for her to go to school I was again overwhelmed by the support extended for her transition. Even her new school took time to tell me that they were impressed. It was a hard day saying good by to our pre-school days with Conductive. They had become a big part of our family. The Graduation Ceremony was beautiful and emotional and a lovely time to reflect on our years there. Phoebe does not attend a Conductive Education Primary school but we have the option to attend an after school programme. Phoebe looks forward to these every week and our journey still continues.